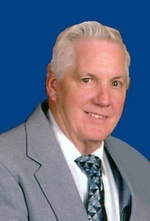 William John “Bill” Hanna, 75, of Gardner, KS passed away August 8, 2016 at home. A Prayer Service will be 10:30 am Monday, August 15, 2016, at Bruce Funeral Home, 106 S. Center, Gardner, KS 66030 913-856-7111. Memorial contributions may be made to the National Parkinson’s Foundation or the Alzheimer’s Assoc. Bill was born February 28, 1941 in Darby, PA to Agnes M. (Sullivan) and Clarence R. Hanna. He graduated High School in Springfield, PA. Bill served in the U S Air Force. Bill married Mary Louise Van Skike on December 24, 1963 in Great Falls, MT. He was a supervisor for 32 years at the Philadelphia Electric Co. Power Plant in Pennsylvania. They moved from PA to Wyoming, living there for 15 years where he drove a school bus in Laramie. After a short stay in Washington, they moved to Gardner in 2012. He worked as a crossing guard at Moonlight Elementary. Bill was a skilled A thru Z handyman. He was an avid hunter and fisherman and a volunteer at the Hillsdale Gun Club until he became ill. Bill and Mary’s grandson Matthew is living in their home. He will be dearly missed. He was preceded in death by his parents and three brothers, Paul, Mike and Earl Hanna. Bill is survived by his wife Mary, of the home; children William J. Hanna, Jr., wife Elizabeth of Plano, TX, James W. Hanna and wife Shannon of Olathe, KS, Dawn M. Lockett, husband Donavon of Henderson NV, and PJ Hanna and wife Renee of Lakewood, WA; sisters Clare Taylor, Mary Battista and husband Nick, Agnes Blisard and husband John; sisters-in-law Ellen, Anne and Carol Hanna. Bill loved all of his nine grandchildren and all of his nieces and nephews.